Acknowledged author Philip Frickey wrote American Indian Law: Cases and Commentary (American Casebook Series) comprising 1007 pages back in 2015. Textbook and etextbook are published under ISBN 0314290230 and 9780314290236. 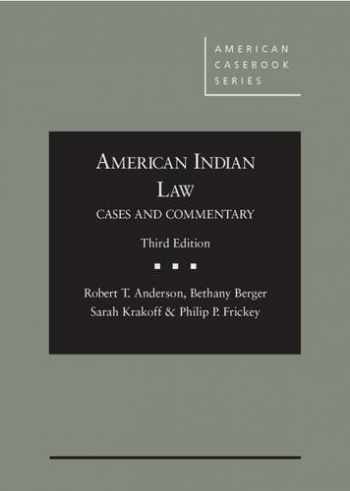 Since then American Indian Law: Cases and Commentary (American Casebook Series) textbook received total rating of 4 stars and was available to sell back to BooksRun online for the top buyback price of $90.22 or rent at the marketplace. This casebook provides an introduction to the legal relationships between American Indian tribes, the federal government, individual states, and others. The foundational cases are incorporated with statutory text, background material, hypothetical questions, and discussion problems to structure the classroom experience and enhance student engagement. Historical materials are explained to highlight their modern relevance. The third edition includes expanded materials on law and order within Indian country, the Indian Child Welfare Act, and recent Executive Branch actions that increase tribal authority.